Back to School Review: Pink Blu tack, Sew Simple and Glue Pens like felt tips! Well back to school is approaching fast and with it the nations love for stationery is renewed. 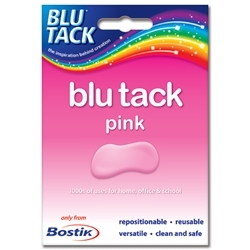 Bostik sent me a range of Blu Tack, Pink Tack, Sew Simple and Glue Pens. New products always excite me and these are rather inspired!I have as a result been hugely popular with little girls aged 5-16 who have gone crazy for them! Even my friends, grown women in their 40’s, thought it was fabulous. It’s certainly sticky and effective and clean to remove and when you use it you don’t see it so i cant fathom why being pink matters but it does so ! Lisi used it to stick pictures on her door, make boats, put her painting son the fridge and hang birthday cards up. Sew simple is a genius product. Did you know it sticks together fabric just as if you have sewn it. It creates a permenant bond and an invisible mend which remains flexible when dry . It sticks in just one minute and is safe and easy to use. What a perfect product . You can use it for hems, turn ups, labeling, soft furnishings, fabric repairs and alterations. My favorite thing to use it for is to stick on cub badged saves me hours. I am a rubbish sewer and the badges I sewed on used to look a right mess and now they look super neat. The other item we reviewed for Bostick that I also felt was so inspired and a real asset to any pencil case was the Sticki glue pen.Such a simple idea really but such a super idea. A pen that draws a very neat and fine line of glue. No mess, no waste, no splodge and really easy for small hands to control. I love this. My daughter made a scrap book of all she had done this summer and this was perfect fr sticking in her pictures and bits and bobs. Don’t they look neat. because it works like a felt tip this glue is really easy to control. I think these new products from Bostik are great, really useful and very appealing. They really cheer up going back to school and homework!